We start from an early age exploring our surroundings where we learn new experiences on a continuous basis. Some of these learnings are positive, others may be negative, but through each individual encounter our foundation of knowledge increases. Even as we grow older, we confront different environments and challenges which ensure that we are constantly adapting to our changing surroundings, just like our physical appearance alters with increasing years. However, there is a common constant in place throughout this learning and ageing process, that being the ongoing linkage of ideas where one thought is added to another thought to build a larger and ever expanding idea base. To demonstrate this process, let us consider one of the most used building blocks that is familiar to all of us, that of a single brick of Lego® (“one idea”). To this brick we add another brick (another “idea”). We then add more bricks which are accumulated with time (“as we age”), where the process continues until we have a vast collection of bricks (or “ideas”). 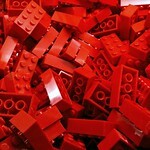 We could just leave the bricks in a large random pile, but we don’t. We join these bricks to make various shapes which we continually modify based on our experience and desires. This simple analogy demonstrates that what it means to age where the concept of idea innovation becomes ageless. As we get older, we add our accumulated ideas and thoughts into an assembly of activities that are relevant for each stage in our life. The key is to keep finding new “bricks”, not to sit back and be impressed with what we have “built”, but to keep on building! It is said that a goldfish when placed in a fishbowl, or larger watery space, will grow to a size that is suitable for that particular swimming environment. 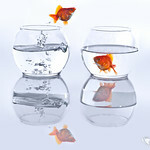 The larger the amount of available water volume, the greater the opportunity for the goldfish to increase in size. Many employees have worked for quite a while in the same job role where they have fully mastered their position and are now regarded as the expert within their business organization. In essence, they are the “goldfish in the fishbowl” where they have grown to their maximum size potential. However, what if they were moved into a new role, or transferred into another business division, or leave and join another company? They would still have the experiences that they had established and fine-tuned in their previous role, but they would now have greater opportunity to expand their vision, skills and learnings in the next one. This would be like the small goldfish being placed into a much larger bowl where they could now grow into a more impressive and bigger fish. The key is to not let your current fishbowl size limit your thinking and career potential, but to always looks for the many free flowing streams that will lead you to a larger and more impressive fishbowl or pond (or even an ocean) where you can swim freely and get bigger!